The idea behind Red Planet Blues is a clever one. Mars has been colonised and is the new frontier with many parallels to the American gold-rush of the 1800's. This time around however it is genuine alien fossils that are in demand and fetch a high price. Since pretty much anything can now be synthesized on Earth, collecting something that isn't artificial - such as the remnants of ancient Martian life - becomes highly desirable. People desperate to strike a vein of Fossils in the Martian soil descend upon the planet although few are lucky enough to become wealthy. Alex Lomax is the only private eye on the planet, working the streets of New Klondike - a city that sprung up after Simon Weingarten and Denny O'Reilly discovered the first batch of fossilized Martian creatures. His work is complicated by the increasing popularity of "transfers" - people who have transferred their consciousness into a new artificial body. These transfers reach a level of immortality with bodies that can be stronger, faster and more attractive than the original. They can be repaired quickly and moved to another body should one become too worn or damaged. Sawyer manages to capture the "Noir Detective" feeling perfectly, a style that works surprisingly well against the backdrop of the martian frontier - almost a modern / science fiction wild west in nature with many an opportunity for corruption and crime. Many have attempted a wild west enthused science fiction and almost all have resulted in a horrible mess. Red Planet Blues manages to avoid this completely - it really does feel incredibly inviting and natural. Partly this is due to the fact that the author doesn't try and make the book a futurist western. Instead we have a style that feels much like firefly, all dusty and earthy and realistic. The idea of the transfers adds a great deal to the charm and integrates well with the plot. Not only that but it changes the whole dynamic of the book and elevates the feeling of the gumshoe detective story. 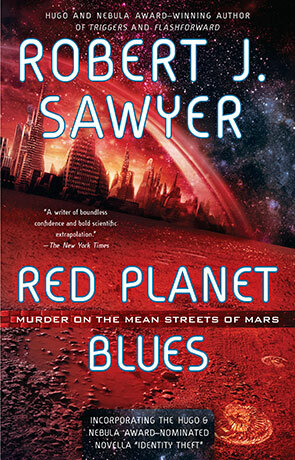 I've read a few Sawyer books and while all have been good Red Planet Blues is on a different level entirely. It just oozes charm and with and noir tinged sophistication. The plot twists and turns at just the right moments, keeping the reader on their toes and the well though-out characters react realistically. Sawyer has done an excellent job of creating believe-able, elaborate people that inhabit this rich world. Above all Red Planet Blues is a great deal of fun, never taking itself too seriously the book is an effortless joy to read. A unique novel that hits all the right notes, Red Planet Blues is a resounding success. Written on 15th August 2014 by Ant.